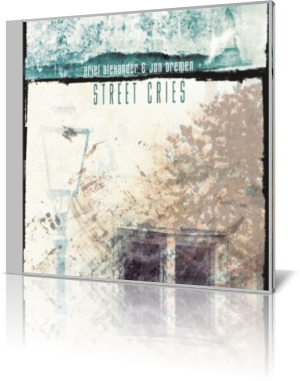 Using a traditional song as inspiration for the title, saxophonist Ariel Alexander and guitarist Jon Bremen release Street Cries (2014), a short set of five songs that offers about 25 minutes of play. In addition to their primary instruments, Alexander and Bremen are credited with programming. The other musicians are Louis Cole, drums; Vardan Ovsepian, keyboard and piano; Tim LeFebvre, bass; and Sara Leib, vocals. “Street Cries of Charleston” is a bit abstract. Punctuated by the midtown rush of the drum track, it has a mix of sounds from the melodic saxophone to various electronic effects. Rather than a discernible composition of verse, chorus and middle break, it’s more a case of dropping into the inner city and letting things happen. “Pepper Pot” leans toward rock fusion. Though other instruments lead, Cole’s steady play on the kit highlights this selection. Ovsepian is out front much of the way with Alexander playing more of a supporting role. “September,” one of two Alexander originals, hints toward an ambient, classical music piece. Its mood conjures a vision of the approaching autumn season. Alexander plays softly but joyfully. LeFebvre’s bass is more prominent here than on other tracks. Alexander is originally from St. Louis. She earned a bachelor of arts at Indiana University and her master’s and doctoral degrees from the University of Southern California. She has performed with such artists as Stevie Wonder, Steve Miller Band, Take 6, Nancy Wilson, Patti Austin and Ruben Studdard. As a studio musician, she regularly records for television and film soundtracks. Bremen found inspiration in Charlie Parker, Bud Powell, Clifford Brown and other jazz legends. He also studied music at Indiana University and the University of Southern California. His guitar work is featured on numerous commercial and film recordings. Street Cries takes an unusual approach. Each musician recorded the tracks separately, using his or her own ideas. The result is something that, while cohesive as a group, exudes a sense of individual freedom.